The Patterns for e-business are a group of proven, reusable assets that can speed the process of developing applications. The Portal Search Customer Design builds off the Portal Composite Pattern, combining Business and Integration patterns to help implement a portal search solution. 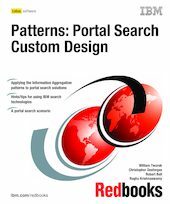 Part 1 of this IBM Redbooks publication provides introductory material around the IBM Patterns for e-business, and the Portal Composite Pattern. Part 2 guides you through the process of choosing the Business and Integration patterns of the custom design, and then drills down to the Application and Runtime patterns, and Product mappings. Part 3 provides a set of guidelines for implementing and building a portal search solution, including a discussion of search technology selection criteria, as well as application design and development. Part 4 demonstrates how to implement a portal search solution via a technical scenario. This technical scenario uses the WebSphere Portal Extend offering, combined with Lotus Extended Search.